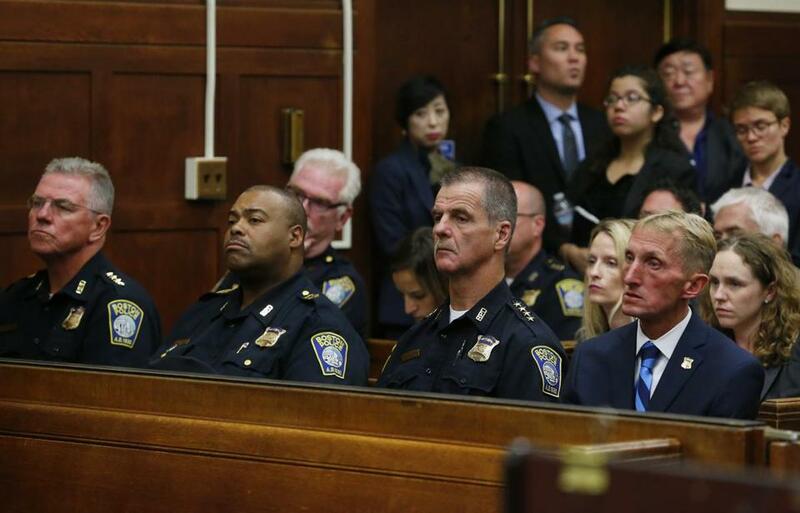 Members of the Boston Police Department, including Commissioner William Evans (right) and Superintendent-in-Chief William Gross (second from left) listened to proceedings Tuesday during a hearing over the issue of a pilot program to study body cameras for officers. One hundred Boston police officers and eight members of the command staff are expected to head to the streets Monday wearing body cameras, after a Suffolk Superior Court judge denied a request from the patrolmen’s union to halt the pilot program. Judge Douglas H. Wilkins ruled Friday that Boston Police Commissioner William B. Evans had the authority to order officers to wear the cameras after no volunteers stepped forward. The pilot initiative was originally conceived as a volunteer program, but Wilkins ruled that the Boston Police Patrolmen’s Association made “unimpressive efforts” to persuade officers to sign up, at one point issuing a directive that “NOBODY” should volunteer. The judge rejected a request for an injunction from the union representing patrol officers. Read: Horowitz: Do police body cameras really work? A consultant has selected officers of all ages and races from five sections of the city to wear the cameras for a six-month trial. Union president Patrick Rose said in a statement he was disappointed with the judge’s ruling, and stood behind the decision to ask for an injunction. Rose declined to comment on whether the union would appeal Friday’s ruling. At a time of heightened scrutiny nationwide of use of force by police, particularly in communities of color, body cameras have been touted as a way to open a window onto officers’ encounters with the public. Wilkins presided over two days of hearings this week during which Evans testified that he believed he had the legal authority to issue the order, while Rose contended that the union agreed only to a volunteer pilot and that Evans’s order violated collective bargaining rights. In his ruling, Wilkins pointed to a 1962 state law called the “Commissioner’s Statute,” which gives the commissioner authority to determine what officers wear, what weapons they’re issued, and how they’re deployed. During the hearings, the police union cited a study from the Rand Corporation suggesting that officers who wear body cameras are more likely to be harmed than those who don’t. But Wilkins noted that the city cited contrary studies, writing that research is inconclusive. “That in itself is a reason to conduct a [body camera] pilot program here,’’ Wilkins wrote. Wilkins bluntly faulted the union for not cooperating with management to ensure that the pilot program functioned smoothly. Before an agreement was reached on the volunteer pilot program, union officials warned officers not to volunteer. After the agreement was sealed, Wilkins found, union leaders did little to dispel their earlier stance. 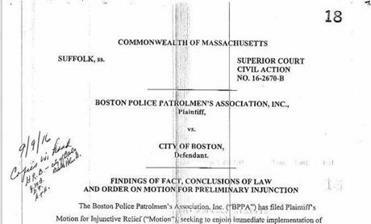 “An injunction effectively rewarding the BPPA for its lackluster efforts to ensure the . . . successful implementation would be unjust,” the judge wrote. Advocates for body cameras lauded the ruling and praised Evans for pushing the program forward. “This is a great moment for police accountability, police transparency, and really, for civil rights in Boston,” Matthew Segal, legal director of the American Civil Liberties Union of Massachusetts, said outside the courtroom after the ruling was issued. Segun Idowu, coorganizer of the Boston Police Camera Action Team, a citizen group that has advocated for the cameras, called the union’s efforts to round up volunteers “a ploy, and an embarrassing one at that.” Idowu said he was pleased with the ruling and said it reflected the true wishes of the city’s officers. Segal and Idowu raised concerns about some elements of the body camera policy, such as allowing officers to view video before writing reports. They said the department should outline discipline for officers who fail to use the cameras properly. Darnell Williams, president and CEO at the Urban League of Eastern Massachusetts, said the cameras will be good for the community. He expects some issues to arise once officers begin wearing them, he said, but that is part of the pilot process. According to a copy of the department’s body camera policy, the cameras are to be activated only in the course of an officer’s official duties to record interactions with the public, including vehicle stops, searches of a suspect before an arrest, and all dispatched calls for service that involve contact with others. The policy states that recordings should continue until the encounter has concluded. Under the policy, people involved in the encounters don’t have to consent to being recorded, except in certain situations. For example, if an officer enters a home without a warrant, occupants would have to be notified they are being recorded and would have to agree. Wilkins’s decision came a day after Evans announced eight command staff members volunteered to wear cameras. The move by the command staff to wear the cameras included Superintendent-in-Chief William Gross and seven deputies. Travis Andersen, John R. Ellement, and Jan Ransom of the Globe staff contributed to this report. Evan Allen can be reached at evan.allen@globe.com.